Community Executive Debbie Smith and Board Chair Dr. Steven Rader along with Centennial committee Sharon Manson, Debbie Danielsm Rita Prose, Estel Ottney and Paul O’Neill finalize plans for the Ohio River Valley American Red Cross Century of Caring Celebration during 2017. PORTSMOUTH — With World War I raging overseas and floods, tornadoes and home fires regularly striking the region, leaders throughout the Ohio River Valley set about to find a way to protect the citizens of the area. Their solution: The establishment of the Scioto County Chapter of the American Red Cross Red Cross chapter in 1917. 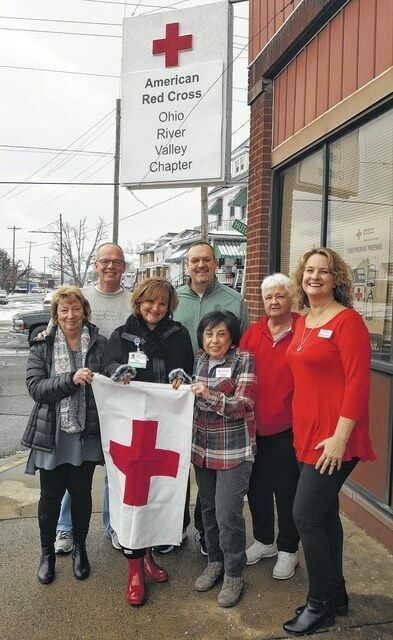 The chapter—which is now known as the Ohio River Valley American Red Cross and serves Jackson, Pike, Adams, Lawrence and Brown counties in addition to Scioto County—has now been in existence for 100 years, providing assistance to thousands of people affected by local disasters including home fires, floods, tornados and seasonal emergencies. And that’s an anniversary worth celebrating. So as we begin 2017, the Ohio River Valley Red Cross is kicking off a yearlong celebration of its 100 years of serving the region. For the next 12 months, we will be commemorating the many past and present contributions of the Red Cross and our amazing volunteers who have given so much their own lives to reach out and care for others, providing warmth and comfort when hope seems to be lost. During the coming year, we will be hosting a number of special centennial events, including partnering with The Scioto Ribber, Rutman/Burnside Realty Group, The Party Connection and the Law Office of Jeremy Burnside in sponsoring the January Chamber of Commerce Business After Hours. * Time: Volunteers are the heart and soul of the Red Cross, helping save lives, providing lifesaving services and leadership, and helping our neighbors to prevent, prepare for and respond to emergencies. As we celebrate 100 years, we are offering special opportunities for others to help shape the next 100 years. * Money: The mission and work of the Red Cross is as important today as it was in 1917 when we first opened our doors, and the way we fund that work is the same as well—-through the generosity of the people of the community. During this milestone year, we are offering those in the community a way to have an immediate impact on the organization’s future, making sure our critical work will grow and sustain in excellence for the next 100 years. * Memory: Over the last 100 years, almost everyone has been impacted—either directly or indirectly—by our efforts. We are offering the people of the community the chance to be a part of our centennial celebration by sharing their Red Cross story. Memories and photos may be sent to debbie.smith@redcross.org or dropped off to the Red Cross office at 1801 Robinson in Portsmouth. Or, a story submission form is available on the Centennial Celebration page on our website: CincinnatiRedCross.org. Memories and photos will be shared on our Centennial blog. We also encourage the entire community to interact with us on social media, following us on Twitter (@ORVRedCross) and Facebook (/ORVRedCross) and using the hashtag #ORVRedCross100 when posting.